Hello! Its Tuesday and, dare I say, I'm breathing a little sigh of relief that both E and T are now back at school and nursery. Don't get me wrong, as half terms go, this one wasn't too bad - I just like my routines! 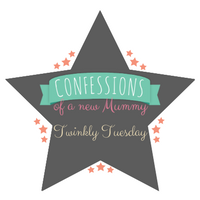 The post I've chosen for this week's Tuesday Twinkler is all about how it feels to live in a rural area, the benefits and the downsides and comes from Any Way To Stay At Home. I must say, I loved reading it and found myself nodding away. I moved from a large town in Wiltshire to a tiny rural not-quite-a-village in Norfolk. From being able to walk everywhere with public transport readily available, it was quite a change moving to somewhere that required me to get in the car to get anywhere. Now though? I live in a larger village, which is still in a rural area and I love it. What about you - do you live in a rural area or town and which would you prefer? Before linking up, if you would like me to send you a weekly tweet to remind you that the linky will be open, please could you take a moment to leave me a comment with your twitter handle. I had been tweeting some of you but I know some people don't want the tweet and I think its better all round if I have a yes or no for clarity's sake. Many thanks.